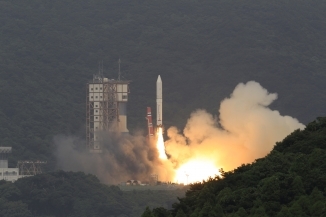 The first Epsilon Launch vehicle (Epsilon-1) developed and launched by the Japan Aerospace Exploration Agency (JAXA) in September 2013 received the JFY 2013 Good Design Award Gold Award sponsored by the Japan Institute of Design Promotion. Epsilon was listed as one of the 1,212 Good Design Award winners from 3,400 nominees, then selected for the best 100 products, and finally chosen for the Gold Award this time. The following is the evaluation of the Epsilon from the Good Design Award selection committee. "The Epsilon Launch Vehicle is not a transportation system for carrying people. It is a rocket to transport observation satellites and equipment to space. 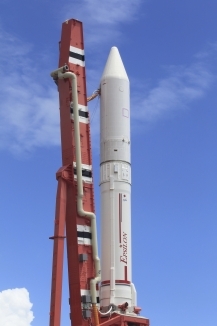 Japan possesses excellent solid propellant rocket technology, and the development purpose of the Epsilon is obvious. It exclusively aimed at concentrating every aspect of technology so it is high performance, lightweight and compact in size, as well as being low priced, and simple for assembly, launch preparation and post-launch operations. By doing so, rocket launches will not be considered as an unusual heavy-duty task but just "a part of daily life". This view is consistent with the goal of industrial design, thus we would like to highly evaluate the Epsilon in this regard. The launch vehicle itself is quite simple. JAXA's attitude "to lower the threshold to space (JAXA)" requires further symbolism in appearance design. In that sense, we would like to expect the possibility of more elaboration in graphic design. We had wondered if the Epsilon is an appropriate award candidate for the mobility division, but we concluded that it is the right target for the award if we understand the Epsilon as a means to transport our dreams to space. We would like the Epsilon to proudly compete in the international market."